I don’t know about you guys, but I’m over this winter weather! The polar vortex has been sllllloooowly moving through and it’s been downright frigid, snowy and so icy. Top it off with a ridiculous amount of snow days and this mama is ready for some warmer and sunnier weather. 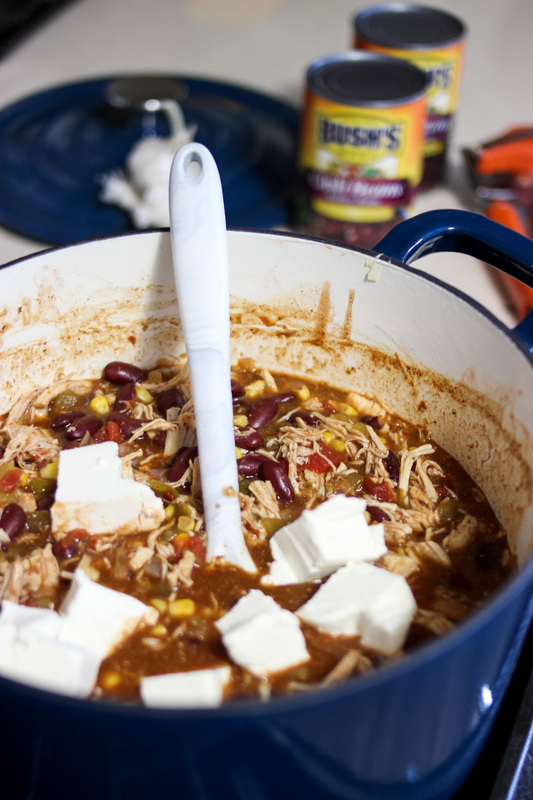 This weather makes me crave all the comfort foods and one of my absolute favorites to make is creamy chicken chili. I love making a big batch of it to heat myself from the inside on these cool days. 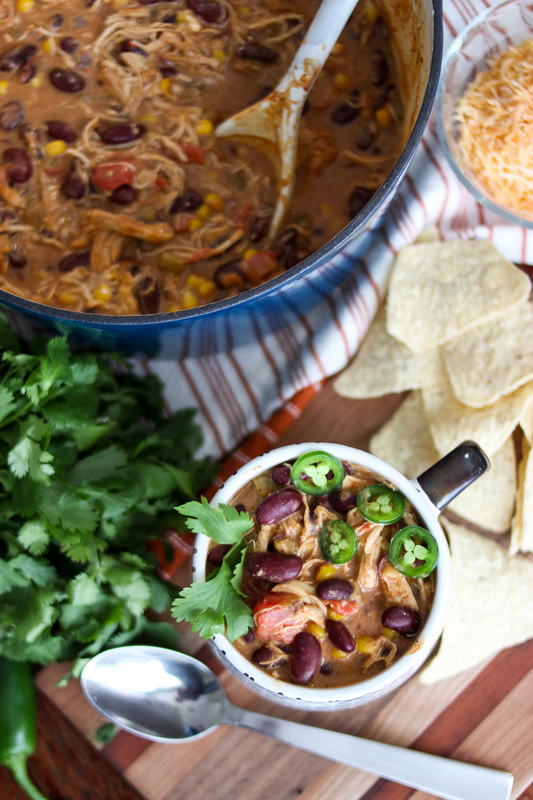 Aside from the obvious comfort and warming factor, chicken chili is a quick meal (especially with the use of BUSH’s Chili Beans) that reheats easily for lots of great leftovers throughout the week. Most of the time I double this recipe because it’s so addictively good. 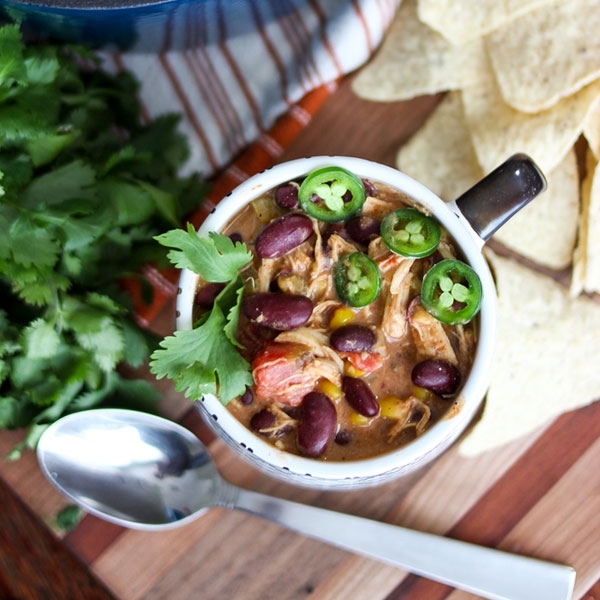 This creamy chicken chili is one of those meals that hits the spot when you are looking for something totally satisfying, but not looking for something that’s super labor intensive to make. A meal that makes you just feel good and happy with little effort behind it too. 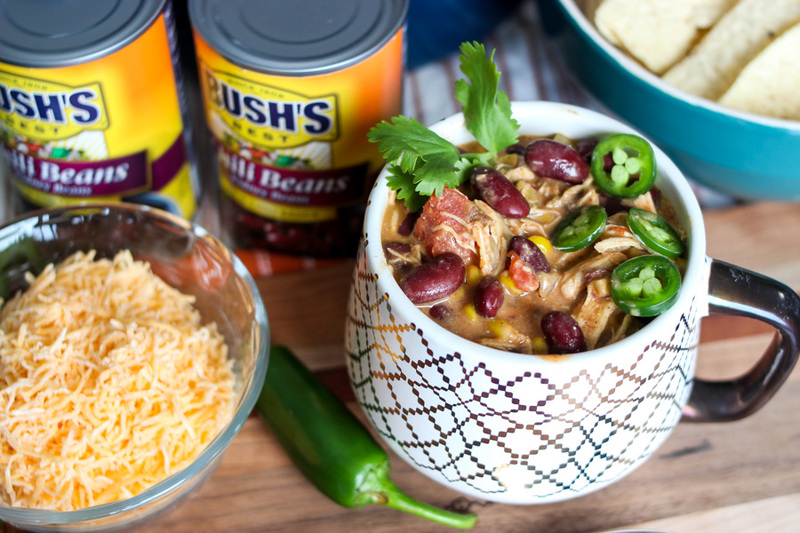 Bold flavors, perfectly cooked beans, hearty serving of protein from the chicken, just the right amount of kick, creamy base and plenty of delicious toppings! In the last month, I’ve switched up my normal recipe to add in BUSH’s Chili Beans (that are made just for chili). The great thing about using these beans is that it cuts down on the cooking time tremendously without sacrificing flavor. I used to let this chili simmer for hours, but since I’ve began using BUSH’s Chili Beans, I can whip it up in around 30 minutes. 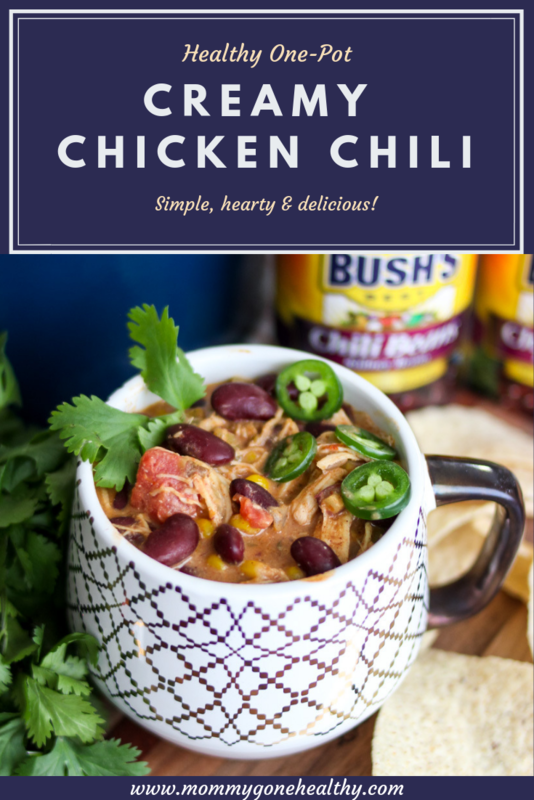 BUSH’S Chili Beans are slow simmered in chili sauces (made with a special blend of chilies, spices, garlic and onions) so that the chili flavor is cooked in every bean which gives your chili that cooked all day flavor right out of the can. It’s a easy way to upgrade your chili and make this a simple weeknight meal to feed your family. 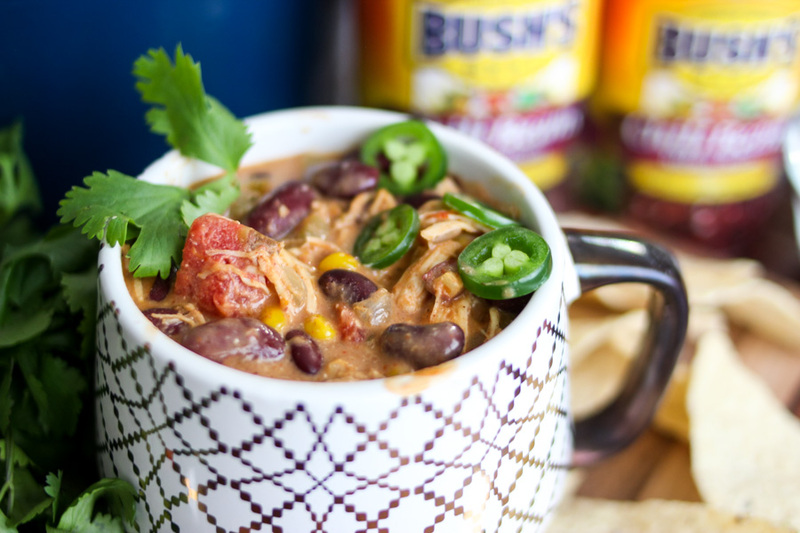 For this lightened recipe of creamy chicken chili, I use BUSH’S Chili Kidney Beans, some spicy green chiles to add a little heat, and a creamy addition of light cream cheese (opposed to heavy cream) at the end to give it a smooth and creamy flavor. If you prefer other beans, you can substitute with any of the other BUSH’s Chili Beans with similar results (they have pinto, black, white, red or mixed beans, mild, medium or hot sauce). You can use pre-cooked chicken breasts or even use rotisserie chicken for ultimate ease! I always love sneaking in extra veggies when I can, so adding corn and tomatoes is a great way to add more veggies. If you or your family isn’t a fan of spicy, scale down use less of the chili seasoning to your taste. For a little extra spice, add a few dashes of cayenne! One really important factor is to make sure that you don’t overcook! You don’t want your beans to get overcooked and mushy. 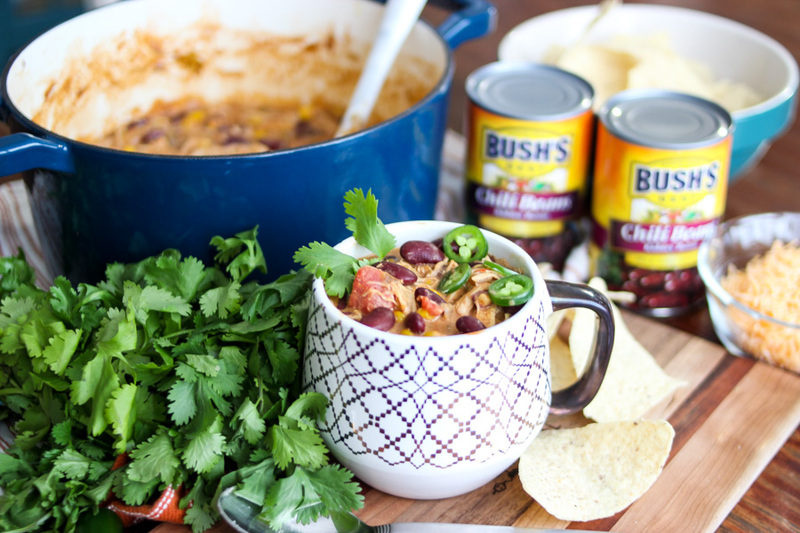 BUSH’S uses the highest quality beans that are perfectly cooked so you simply need to heat your chili and let simmer a few minutes to be all set with an amazing, yummy and family friendly meal. Add drizzle of oil to large pan over medium heat. Saute onions and garlic until transparent. Add all remaining ingredients except for cream cheese to pan. Simmer for 10 minutes of medium-low heat and stir occasionally. Reduce heat to low and add cream cheese. Mix often until completely melted into chili. Top with desired toppings (jalapenos, avocado, cilantro, tortilla chips). What’s your favorite type of chili? Any fun add-ins? 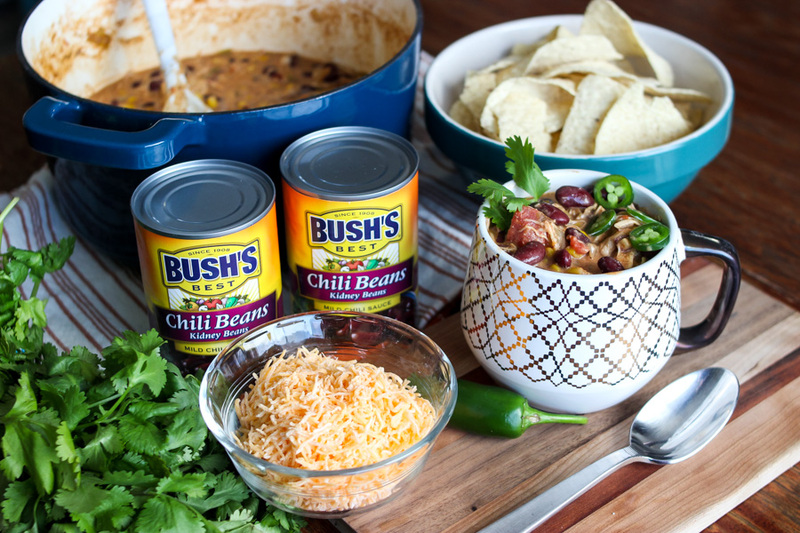 Don’t forget to buy a few cans of BUSH’S Chili Beans on your next grocery run! They have a satisfaction guarantee so if you are not satisfied with the BUSH’S® Chili Beans product you purchased, you can register to receive a coupon for a free BUSH’S® Beans product up to 16 ounces. 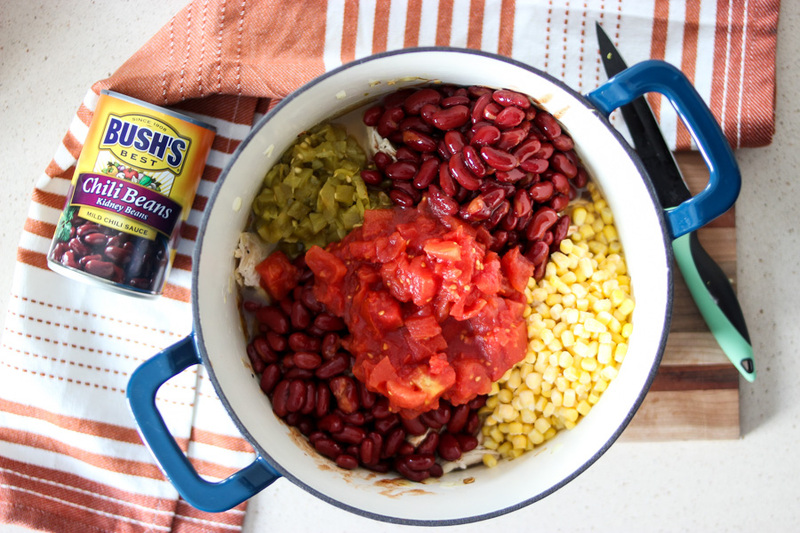 This could include BUSH’S® Baked Beans, Variety Beans, Savory Beans and more (Some restrictions may apply. 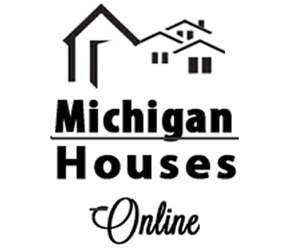 Visit bushschilibeansguarantee.com for complete terms and conditions). Yuum! This looks amazing! I LOVE chili! Yum! It’s been snowing nonstop here in Idaho this week and a good soup or chili is exactly what I need to warm me up! Your presentation makes this look super yummy! I prefer the chicken chili to the beef, and the more cilantro the better!